Saving the World…One Deal at a Time! Organic Coupon Matches, Organic Recipes and More! Get $2 coupons by sharing their campaign. All three of these products are great for kids to go back to school or if you need snacks for the glove compartment (to provide healthier alternatives). 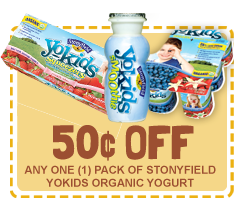 There are four -.50 off coupons for Annie’s Homegrown, Honest Kids, Stonyfield and Organic Valley. Happy Shopping!! !